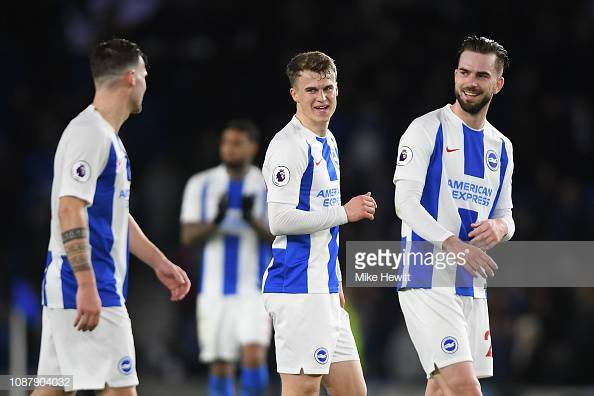 Pascal Gross, Solly March and Davy Propper celebrate Brighton win over Everton images courtesy of Getty Images. Brighton will be hoping to start 2019, as they finished 2018 with three points when they travel to West Ham United. As mentioned above The Seagulls ended the year on a high with a 1-0 win at home over Everton. The Hammers will be hoping not to start 2019 as they finished 2018, with a defeat like they did against Burnley last Sunday. Brighton are set to have Jose Izquierdo back available for selection after he has managed to shake off a knee injury which he picked up in the win over Crystal Palace at the start of December. Brighton will also have Dan Burn available for selection after he signed in the summer, but spent the first half of the season out on loan at Wigan Athletic. The Seagulls will be without Matthew Ryan and Alireza Jahanbakhsh, who are both away with Australia and Iran respectively at the Asia Cup. Brighton will probably lineup as follows: Button, Montoya, Duffy, Dunk, Bernardo, March, Propper, Stephens, Locadia, Gross and Murray. West Ham are set to have Pablo Zabaleta available after he missed the defeat against Burnley. But they will be without Javier Hernandez, who will need another week to recover from full fitness. This means West Ham will probably lineup as follows: Fabianski, Zabaleta, Diop, Ogbonna, Cresswell, Snodgrass, Noble, Rice, Anderson, Arnautovic, Perez. One player West Ham will have to keep a very close eye on is Jurgen Locadia. The Dutch forward has started Brighton's last three matches and has scored two goals in his last two games. Locadia has been a handful for defences since he started at Bournemouth, a few weeks ago and he has certainly showed why Brighton paid £14 million to sign him back in the summer of 2017. The 25-year-old forward will be hoping 2019 can continue as 2018 finish and he is going to make it really difficult for the likes of Izquierdo, Anthony Knockaert and Jahanbakhsh when he returns from international duty to get into the start lineup. Brighton will have to keep an eye on Felipe Anderson. The Brazilian winger has been in tremendous form scoring goals and getting three assists since West Ham spent around £36 million to sign him in the summer. Anderson has the ability to create something out of nothing so both Martin Montoya and Bernardo will have to be keep tight to him and not give him a chance to shoot from range.